On January 3, 2019, President Sahle-Work Zewde of Ethiopia met with State Councilor and Foreign Minister Wang Yi at the presidential palace in Addis Ababa. Sahle-Work Zewde asked Wang Yi to convey her warm greetings and best wishes to President Xi Jinping. She said that Ethiopia-China relations are developing well at both bilateral and multilateral levels and the breadth and depth of bilateral relations are impressive. China's large amount of investment and cooperation with Ethiopia have promoted Ethiopia's economic development and improved people's livelihood. The Ethiopian government and all sectors of society are committed to further strengthening cooperation with China and look forward to stronger bilateral relations in the future. Since its establishment, the new Ethiopian government has been actively committed to development and reform and hopes to get support from the Chinese side. Sahle-Work Zewde congratulated China on its successful hosting of the Beijing Summit of the Forum on China-Africa Cooperation (FOCAC), saying the high attendance rate and fruitful results of the Summit fully demonstrate China's sincere willingness and broad prospects for cooperation with Africa. Ethiopia will continue to actively support and participate in the cooperation under the Belt and Road Initiative. Ethiopia and China share consensus and common interests in maintaining multilateralism and protecting the world order from shocks of unilateralism. It is hoped that both sides will continue to strengthen coordination and cooperation in the United Nations (UN) and other international affairs. 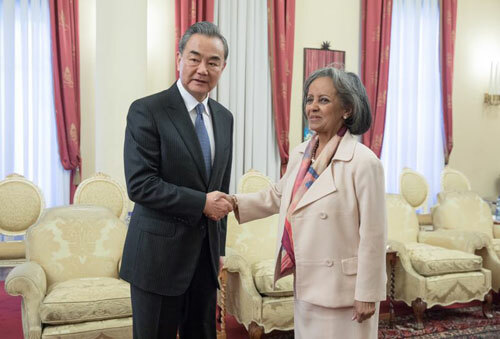 Wang Yi conveyed greetings from President Xi Jinping to Sahle-Work Zewde. Wang Yi said Ethiopia is a major country in Africa and an important developing country with huge development potential. The rejuvenation of both China and Ethiopia means the growth in the strength of developing countries as well as the enhancement of the capability of preserving world peace and stability. The new Ethiopian government has adopted many positive reform measures since its establishment. It is believed that the Ethiopian government and people have the ability and wisdom to find a successful development path that suits the national conditions of Ethiopia and is practical and effective. The Chinese side is willing to continue to be a long-term and trustworthy cooperative partner of Ethiopia in the process of Ethiopia’s national development and rejuvenation. Wang Yi stressed that China and Ethiopia enjoy traditional friendship and have a solid social and public opinion foundation for strengthening all-round cooperation. The Chinese side has always viewed and developed its relations with Ethiopia from a strategic and long-term perspective. President Xi Jinping proposed at the FOCAC Beijing Summit last year that China and Africa should jointly implement the eight major initiatives, which has charted the course for China-Africa cooperation and opened up bright prospects for the future. The two sides can take the implementation of the outcomes of the FOCAC Beijing Summit and strengthening cooperation under the Belt and Road Initiative as opportunities to push bilateral mutually beneficial cooperation in all areas to new highs. It is hoped that Ethiopia will continue to play an important role as a bridge to promote China-Africa overall cooperation. Wang Yi said that at present, unilateralism is on the rise and the international rules are under threat. The Chinese side is willing to work with Ethiopia and other countries to continue to intensify coordination and cooperation in the UN and other international affairs, firmly maintain multilateralism, uphold the rules-based international order, safeguard the common interests of developing countries, and make positive contributions to addressing various global challenges and safeguarding world peace and stability.